Shree Sant Seva Ashram run a deluxe Yatri Niwas for travellers visiting Rishikesh. 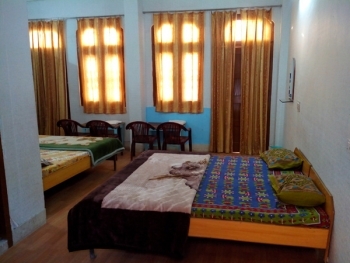 Located on the banks of Ganga, the guest house offers comfortable accommodation with array of facilities. The pious river Ganga is called as Maa which means mother as it bestowed with ambundance, fertility and provides water to millions of people. Her spiritual charm and the piousness of this place attracts a lot of tourists.The ashram provides a comfortable stay at its well appointed rooms. The ashram body is also engaged in social work and activities regarding the welfare of poor people. The yatri niwas or guest house is situated near Laxman Jhula in Rishikesh. It is nestled at the foothills of the lower Garhwal Himlayas. The ashram is located on National Highway 58. The ashram is easily accessible as Laxman Jhula Taxi Stand is at proximity to the hotel. The guest house offers comfortable lodging in well furnished rooms. To offer a comfortable stay the ashram provides accommodation in A/C Suite, A/C Deluxe and Standard Rooms. The spacious rooms are well equipped with basic amenities such as attach bathrooms, hot/cold running water, bathroom toiletries, clean beds and furniture. The guests can enjoy an enchanting view of the river Ganges flowing graciously across the ashram. The ashram possess its very own multi cuisine Geetanjli Restaurant. It serves freshly cooked delicious Indian, Chinese, Mughlai and Continental cuisines to the guests. One can enjoy having a nice chat with the fellow travelers over espresso at the ashrams Tea Lounge. The ashram houses other fine dining restaurant such as Cafe Mardi Gras, Whispers of the Orient and The Village which serves an array of authentic cuisines. The yatri niwas is located near Laxman Jhula in Rishikesh. Rishikesh being a famous tourist destination is well connected by motorable roads from major destinations of India. State owned buses as well as private buses operate from ISBT Kashmiri Gate in New Delhi. Rishikesh is connected by rail via Haridwar 24 km to major cities like Howrah, Bombay, Delhi, Lucknow, Varanasi, Dehradun and many other cities. The nearest airport to Rishikresh is Jolly Grant Airport at Dehradun. It is located at a distance of 20 km. The Dehradun airport operates daily flights with Delhi. Taxis are easily available from the airport to Rishikesh.